Morgan Allender is a contemporary painter based in the Adelaide Hills, South Australia. Profiled by Vogue Living Magazine (“Next Generation”, September 2013) as “one of today’s brightest crop of design and art talent", she works primarily within a framework of large-scale, gestural paintings. Her work reflects an ongoing exploration of the parallels between the materiality of oil paint and the chaotic elements of the natural world. Drawing on a multitude of sources, including botanical symbolism, ecology, weather systems, horticulture, and the landscape genre, she is most interested in the cultural interactions between people, plants and the greater landscape. 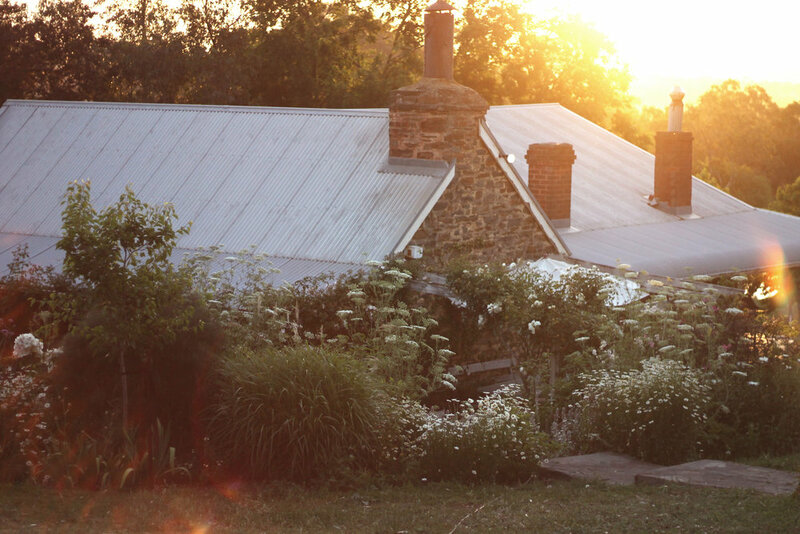 In 2010 Morgan and her partner, furniture designer Justin Hermes, purchased an 1850s stone Shepherd's cottage on a small hilltop acreage in the Adelaide Hills (below). Despite its being in a partly dilapidated state, with caved-in floors and resident bats, the romantic potential of the place was undeniable. More importantly, it had excellent soil for gardening and room for a studio. The past 8 years have been spent slowly renovating the buildings and creating a garden from scratch on the windy hillside. The parallels between the processes of painting and the workings of the natural world, as experienced through the seasons in the garden, continue to be Morgan's greatest source of inspiration. Her studio is in a converted hay shed on the property where she can be closest to her natural subjects. Receive updates from Morgan's studio, invitations to upcoming exhibitions and advanced previews of new paintings. Your privacy is respected. Thank you.